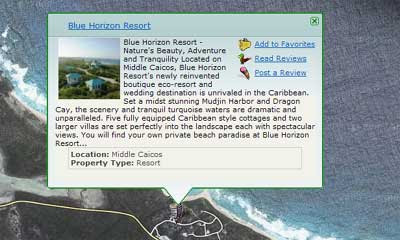 This Google Map from the Jamaican Tourist Board lets you find points of interest on the island. It is possible to search the map or you can just pan the map and the points of interest will load dynamically to reflect the current map view. If you click on any of the loaded map markers an information window opens with a summary of the selected point of interest and links to further details. This Google Map from WhereToStay.com lets you search for hotels on these two sub-tropical islands. As well as allowing you to search for hotels by location it is also possible to view restaurants, beaches and points of interest on the islands. 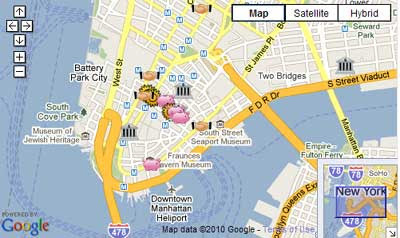 Each hotel map marker includes details about the hotel and a link to further details and reviews of the hotel. 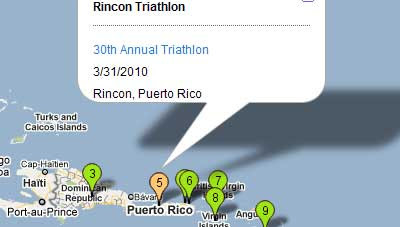 Triathlon website Goodtri.org is starting to add Google Maps to help users find upcoming triathlon events. The first of the maps is for the Caribbean. The map shows upcoming triathlons in the Caribbean. Each of the map markers contains a link to the main details about the race on Goodtri.org. Yamusica uses the Google Maps, Last.fm and Bandintown APIs to bring you information about live music events, concerts and venues in your town. You can search the site by location or by venue and get a list of all upcoming concerts. If you click on the 'event details' button on any of the returned results you can get details about the band / artist, dates and times of the concerts and a Google Map of the venue. Anybody who is anybody in the geo-world is currently at Where 2.0 (which is why I'm stuck in rainy London). The Google Earth Blog has a good round-up of some of yesterday's conference highlights. One of yesterday's big announcements at the conference was about the Google Maps Data API. Google have now made it easier to import your geographic data as a single CSV file or KML file. You can read more about this announcement on the Google Geo Developers Blog. If you are lucky enough to be attending the conference then you can meet Google Maps Mania founder Mike Pegg who is at the Google booth, with other members of the Google Geo Developer team and Enterprise Geo folk that work on the Google Earth vector layers team. If you are not at Where 2.0 (or if you are) then you can follow #Where2.0 on Twitter. 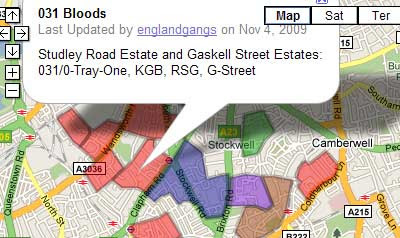 The Gangs of London website is using Google My Maps to show the territories of London's street gangs. The site has so far mapped the names and territories of more than one hundred of the capital’s street gangs. According to the site's creators the maps are made with the help of "those involved or associated to those involved" with gangs, including members, teachers and youth crime workers. The site features pages for a number of London boroughs. The borough pages take an in depth look at the neighbourhood gangs in each region and most of these pages include a Google My Map showing shaded polygons of gang territories. I can't help agreeing with The Daily Telegraph (for the first and hopefully the last time in my life) that whilst the site does tend to glamorise street gangs, if you live in London, it is very hard to resist checking out the gangs in your neighbourhood. 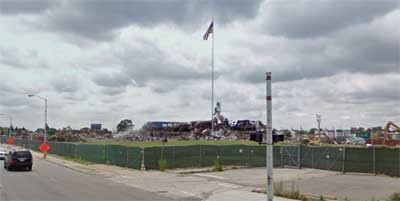 USA Today have used Google Maps to show the locations of 128,000 schools and track the path of industrial pollutants. The aim of the site is to enable parents to determine the exposure levels to toxic chemicals of schools in their area. 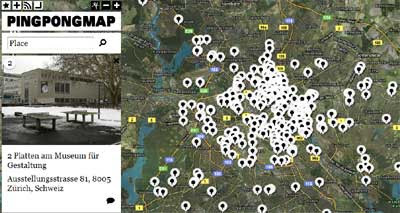 It is possible to view each school on its own individual web page with a Google Map showing its location, the location of nearby schools and the locations of nearby industrial polluters. The page will also tell you in which percentile the school is and how many schools in the country have worse pollution. 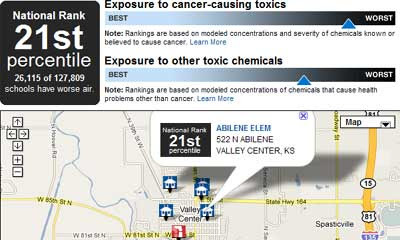 The individual school pages also chart the school's exposure to cancer-causing toxics and exposure to other toxic chemicals using two simple graphs. The graphs show the school's exposure on a simple best to worst scale. At about 8pm Sunday night in Portland, Oregon a large explosion was heard by many people. Geo-developer Reid Beels quickly set up a Google My Map so that people who heard the explosion could show their locations. Using the open collaboration setting in Google My Maps he allowed people to add coloured map markers to the map to say whether they heard the explosion or not. Red markers meant they 'heard a loud boom, windows or building shook', blue markers that they 'heard it, but no further detail', yellow indicates it was 'heard with no shaking' and green indicates the explosion was not heard. The clustering of the markers soon suggested that the explosion originated near Sellwood Bridge. 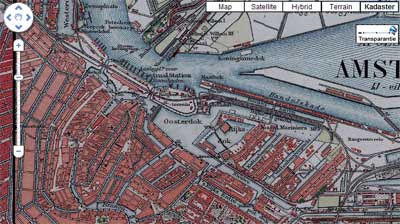 Using the map the police were able to pinpoint the location of the explosion and discover that it was caused by a detonated pipe bomb. 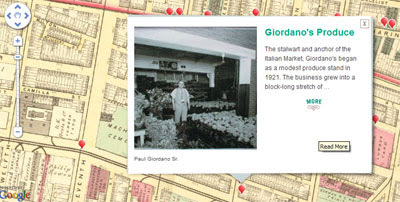 PhilaPlace is an interactive website, created by the Historical Society of Pennsylvania, that connects stories to places across time in Philadelphia’s neighborhoods. The map includes an incredible wealth of information about Pennsylvania's past told through first person memories, videos and photographs. PhilaPlace was first featured on Google Maps at the end of last year. Since then new features have been added to the map. The new 'Streets' tab features enhanced historical maps that reveal in-depth patterns of change over time for specific blocks in South Philadelphia and Northern Liberties neighbourhoods. Land-use and census data also allow the user to recreate details and activities on a street, house by house or business by business basis. For example, the map for the blocks of South 9th Street shows the dramatic rise in Italian immigrant households in the decade between 1880 and 1900. Adidas have produced a Google Maps app that lets you follow the whole Boston Marathon route in Street View. When I first saw the Boston Marathon Street View app my jaw dropped three times in succession. Once because it was a brilliant idea. Twice because it was an idea that I had been working on myself (see the London Marathon in Street View below) and the third time because the similarities with my own Street View app are uncanny. Both the Boston Marathon app and my own London app let you follow the route of the marathons using Google Maps Street View. Both apps let you navigate to points of interest on the marathon route and both apps use an overlay on top of the Street View to enable you to jump forward to the next point of interest or go back to the previous POI. In fairness the Boston Marathon app is better than my London app. The Boston app includes a Google Map of the route and a terrain chart, both of which are missing from my map. Another similarity that both apps have is that they don't seem to work too well in the Chrome browser, which has problems showing overlays on top of Street View. The London Marathon Street View map let's you follow the route of the London Marathon. 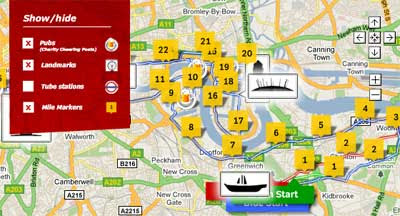 The map shows the Street Views for all the mile markers along the route and also lets you view points of interest along the route, like Buckingham Palace and the Tower of London. If you want a Google Map of the London Marathon check out the official marathon website. The map includes markers for each of the mile markers and also shows points of interest along the route. Interestingly the map also omits the Google Logo, which Virgin just might find violates Google's Terms of Service. Checkin Mania is a Google Maps mashup to track who is checking in around you using FourSquare, Gowalla, Brightkite and Yelp. 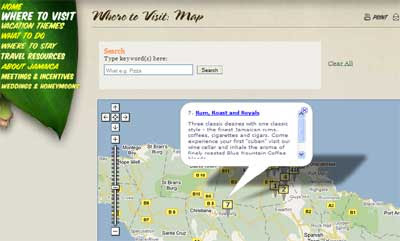 To browse a location you can use the search facility or you can just click on the map. 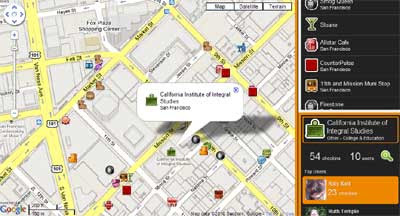 The map will then display all the venues around you and show you who are the top users of that venue with the popular location based social media apps. 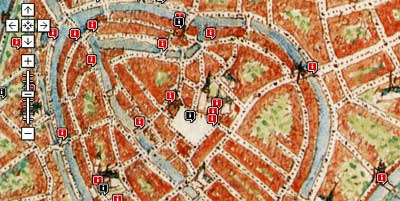 One really cool feature of this map is the vast array of different map markers that are used. The markers let you tell at a glance whether the displayed venues are bars, cafes, auto-mobile garages etc. The number of individualised map markers is incredible, to the extent that Big Ben has a Big Ben shaped marker and the Statue of Liberty has a Statue of Liberty marker. Walk BC is using Google Maps to show the location of walking routes in British Columbia. The map is a joint project by the BC Recreation and Parks Association and the Heart and Stroke Foundation of BC & Yukon. 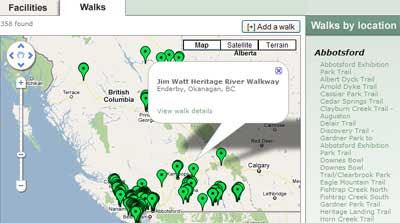 The map allows users to search for walks by proximity to Vancouver. It is possible to search for walks using a slidebar that allows you to search for walks within any distance between 1km and 150km. It is also possible to filter the results by walk difficulty. All results are shown on the map and listed in the map sidebar. If you click on a walk map marker you are given a link to details of the walk and the option to print a PDF map of the walk. Here's a really useful Google Maps mashup for anyone who needs to take a taxi in China's largest city. The Shanghai Taxi Calculator help travellers estimate the cost of a cab ride in Shanghai. It allows users to input departure and destination addresses or select from popular spot list and discover the estimated cost of the journey. All search results are displayed on a Google Map alongside the estimated time of the journey and the estimated cost of the fare at different times of the day. The site also provides other information such as the latest cab rates and a directory of the major cab companies in the city. Dajiudian.info is the leading provider of multilingual China-wide hotel bookings. The site allows you to search, locate and book over 5,000 hotels across China. It is possible to search the site by city, hotel name, date and by hotel rating. The results of a search are then shown on a Google Map. If you click on any of the returned map markers you can view further details about the hotel, including room charges and book your hotel directly from the site. Alfa Romeo have come up with an ingenious marketing website to promote the Alfa Giulietta. The site uses Google Maps Street View to let you see how the car would look if it was parked outside your house (I've used the Arc de Triomphe in my screenshot as that's where I now live). To create your own virtual postcard you just need to enter your address, select the colour of Alfa Giulietta and you will be presented with your virtual driveway. You can also adjust the size of the car and rotate its angle. Your virtual postcard comes with a unique URL and with the option to post it to Facebook or Twitter. Earth Hour takes places this year on Saturday March 27th at 8.30pm (local time). During Earth Hour people from all around the world will be switching off their lights for one hour. Currently 5,649,065 have pledged their support. You can show your support for Earth Hour and see the location of the over 5 million who have already done so on the Earth Hour Supporters Map. 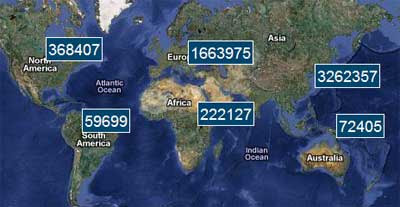 The Earth Hour Supporters Google Map shows the number of people who have pledged to support the hour around the world. The map lets the user see at a glance the number of supporters in each continent. How cool is this? Planet in Action have managed to create bow waves in Google Earth which makes their ship animations much more realistic. Eight people walked around Amsterdam with GPS trackers for a couple of days going about their normal business. Here's an animated video of their tracks. 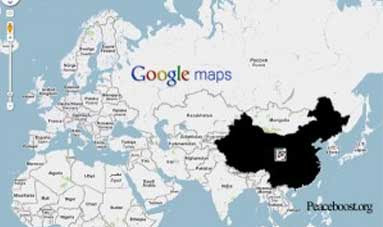 PeaceBoost.org have decided to help Google pull out of China by redesigning Google Maps. Here's the longest place name found in Google Maps Street View - so far. Llanfairpwllgwyngyllgogerychwyrndrobwllllantysiliogogogoch is a village in Wales, UK. 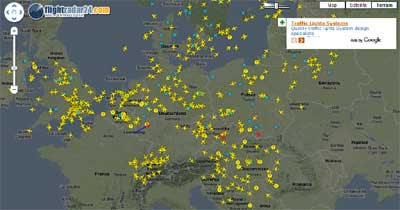 Flightradar24.com shows live aircraft traffic in the airspace above Europe in real-time on Google Maps. The map shows all aircraft equipped with an ADS-B transponder. By clicking on a plane you can view detailed information about the plane, flight and current speed and position. 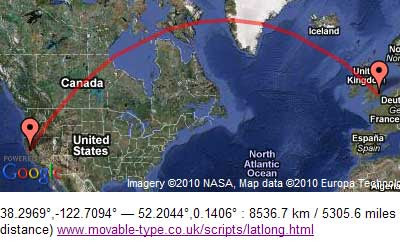 A track of the flight path of the plane is also shown. The colour of the trail behind the plane differs depending on the altitude the aircraft had at that position. If boats are more your thing then check out this post on 16 live ship tracking maps. ZeFrank's 'A Childhood Walk' has been given some much deserved publicity recently. For the project Ze asked his readers to recreate a childhood walk in Google Maps Street View. He then put together a collection of the responses superimposed on top of the appropriate Street View image. The exercise is very effective and seems to have touched the nostalgic yearnings in a lot of readers. So much so that the exercise has now been taken up by a lot of other websites. Teacher Rodd Lucier has taken an emotional ride through his childhood in Street View. In this blog post Rod explores his memories and illustrates each of them with screenshots taken from Google Maps Street View. 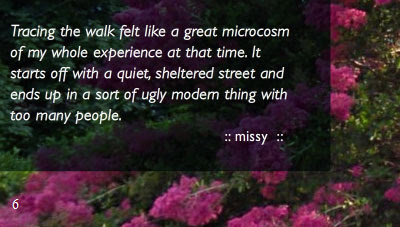 Rod has also put together a collection of other websites and blogs that have created their own memory maps revisiting their childhood haunts with Street View. "The store on the right with the Coke sign was Anna's Confectionary ... I really liked Anna and she once let me in the back to see her house, which looked like it was from the 1880s). After Anne died it became Metcalfe Pizza and a new coat of paint covered the spray-painted (no doubt by a customer) "Anne's" on the side." 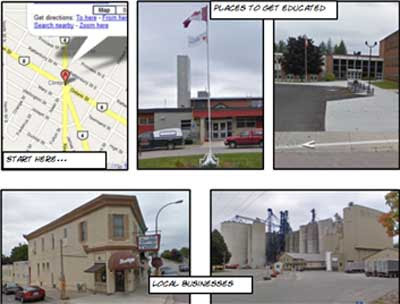 Doug Peterson's memories of Clinton, Ontario. After writing about his own childhood memories Doug Peterson also spent some time pondering how the idea could be developed. I particular like his idea for producing a comic of your virtual journey. Now we all know the shortest path between two points is a straight line. Unfortunately, unless you believe the Flat Earth Society, any journey between two points on Earth usually requires you to make a bit of an arc in your journey. Therefore, when you measure a distance on a two dimensional map, your calculations are likely to be wrong, unless you allow for the curvature of the Earth. To top it all off the script is available for free under a Creative Commons license. Google have added a new service to the Google Maps API. The new ElevationService enables map developers to determine elevation profiles. This mobile application has one simple but effective feature, it allows you to save a location in Google Maps. So for example, when you park your car you can find your way back to it's exact location. Or, imagine you have checked into a hotel in an unfamiliar city, you can store the hotel's location and always be able to find your way back no matter where you wander. To store a location all you need to do is visit the site in your mobile browser. A draggable red marker will show your current location. You can drag the marker around to change the location and when you have pinpointed the location you wish to save just bookmark the map. You now have a saved location. Any time you open the map now you will see two markers, one showing your current location and one showing your saved location. You can even click on your saved location map marker and get walking or driving directions to it from your current location. 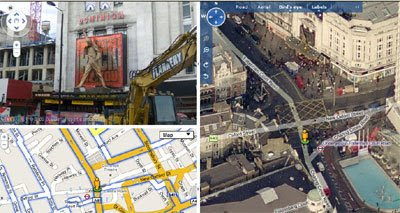 The GeoFuse GeoEye Map allows you to explore GeoEye satellite imagery on Google Maps. 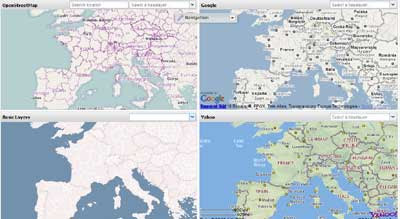 You can search for any location in the world and view the available satellite imagery from GeoEye directly on the map. The current satellite images for any map view are listed in the map sidebar, with information about when the image was taken. You can click on any selected satellite image to get further details, such as which satellite the image is from and what the conditions were like at the time of its capture. It is also possible to download the foot print data resulting from a search and to get a unique URL for each search. One of the best Google Maps driving games has just got a little bit better. The game uses the new Map3D class in the Google Maps API for Flash with Papervision3D to provide a little perspective to what was a top down game. With the new perspective options it is possible to get more of a 3D view in the game. The game comes with two slider controls that allows players to adjust the perspective view and to zoom the view in or out on the map. 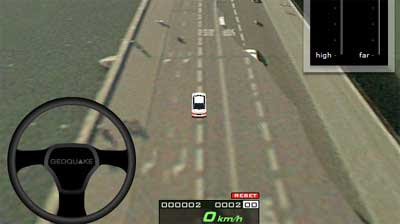 The game also has options to drive anywhere in the world and to drive a car or a bus. CNET have created a Google Maps mashup to compare cell phone coverage in the USA. The map shows the coverage of AT&T, Sprint, T-Mobile and Verizon in 16 US markets. Currently the map shows data for the following locations: New York, Los Angeles, San Francisco Bay Area, Seattle, Chicago, Washington D.C., Dallas, Orange County, Las Vegas, Boston, Philadelphia, Atlanta, Minneapolis, Denver, St. Louis and Houston. CNET teamed with Root Wireless to create the coverage map. The data was collected from client applications placed in consumer phones to record performance data such as data throughput, dropped calls, and signal strength. The map uses coloured hexagons to show the signal strength in different areas. This allows the user to get a quick overview of where signal strength is good or patchy. It is also possible to click on any of the hexagons to get a more detailed breakdown of the signal strength at any location. If looks were everything then this Google Maps mashup of available parking spaces in Santa Monica wouldn't win any awards. However as far as functionality and usefulness go this site is a clear winner. 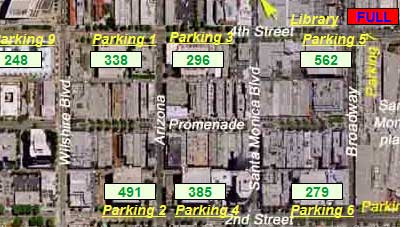 The map shows at a glance how many parking spaces are currently available in Santa Monica's car parks. For example, in the above screenshot you can see that the library car park is full, whilst the car parks around it still have available spaces. If you mouse over any of the yellow links for a car park an information window opens displaying information about the car park's capacity, opening hours and exact address. RouteYou is a route sharing website for hikers, cyclists and car and motorbike drivers. The site uses Google Maps as a means for users to search for routes and to display individual routes. Users of the site can create routes using the RoutePlanner tool, and share the route via groups. Individual routes can be viewed in the RouteViewer where routes can be explored interactively. 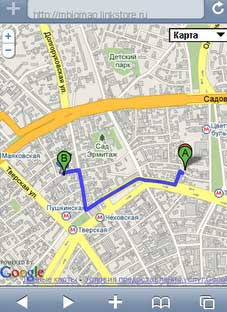 Users can also print routes or download routes in GPS formats. 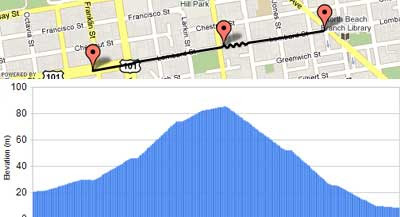 A really cool feature of RouteYou is the elevation charts that are created for each route. 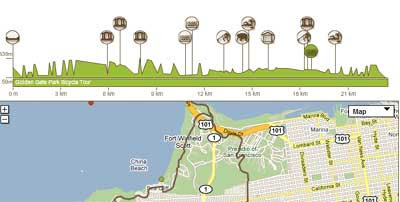 The elevation charts not only show how flat or hilly the route is but also include points of interest that can be viewed along the route. Clicking on a point of interest on the elevation chart will highlight its location on the map and also load information about the place in the map sidebar. Flippity is a Google Maps mashup of eBay listings. The site allows users to search eBay listing by object and location and view the results on a Google Map. The photographs of the results are displayed beside the map. You are also able to refine your search by price and by distance. Another really nice feature is that when the results of a search are returned Flippity automatically loads subcategories for your search term in a drop down menu, allowing you to refine your search further. Lokaliz - France eBay searching (In French). If you missed the Google Earth guy's first outing then check out CollegeHumours Google Street View Guys video. If you liked the Street View image of a seagull in today's Friday Fun post then you are going to love this collection of Street Views by the Burdr website. Burdr have obviously spent a few hours putting together this small collection of ostrich, geese and pigeons that can be found in Google Maps Street View. If bird spotting is your thing then there are also a couple of good satellite images, from Google Maps of birds in this collection of Google Maps super close-up satellite imagery. 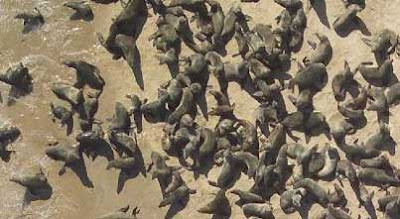 The collection also includes, elephants, seals (pictured), camel, antelope and many more. This little gem from Historical Tweets made me smile. 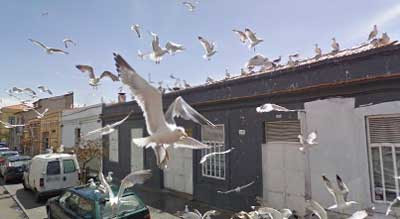 ... and this shot of the Street View car feeding fries to a seagull.